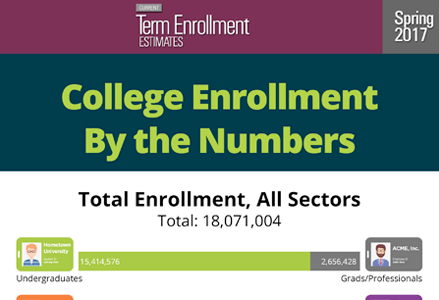 Spring postsecondary overall enrollments fell by more than 272,000 students compared to a year ago, led by a decline of more than 244,000 students over the age of 24 and many were enrolled in a four-year, for-profit institution or a two-year public college, according to the Spring 2017 Current Term Enrollment Estimates report from the National Student Clearinghouse Research Center. The National Student Clearinghouse Research Center today released a new report, Completing College: A National View of Student Attainment Rates by Race and Ethnicity – Fall 2010 Cohort. This report is the first use by the Research Center of a new nationally representative sample of students, enabling the national results released in December, 2016 to be disaggregated by race and ethnicity. The National Student Clearinghouse Research Center released today six‐year, student success outcomes and college completion rates by state, which covers more than 2.9 million students.